ACTA protesters in Europe may still face anti-piracy legislation with Internet freedom consequences. It had been described as a “nuclear weapon” that could be used against Internet users. But today, after a lengthy campaign both off and online, the controversial anti-piracy treaty ACTA was overwhelmingly rejected by legislators in Europe by 478 votes to 39. Negotiations around ACTA, the Anti-Counterfeiting Trade Agreement, had been underway since at least 2008. The treaty aimed to curtail trade in counterfeit goods and was backed by a hugely powerful industry lobby made up of large multinationals like Time Warner, Sony, Walt Disney, and the Motion Picture Association of America. 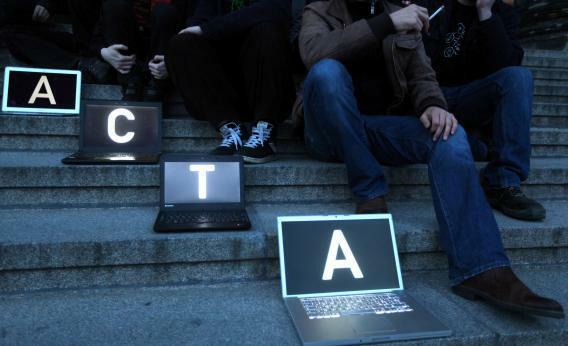 However, concerns that ACTA would inhibit Internet freedom and lead to draconian crackdowns sparked large protests. If adopted by the European Commission, ACTA would have overridden the sovereign laws of countries across Europe, forcing Internet service providers to adopt measures to curb copyright breaches by monitoring their networks. The most controversial and draconian elements of ACTA—like allowing border security searches of computers and iPods for copied music—were scrapped after condemnation. But because meetings about the treaty were continually held in secret and beyond scrutiny, some protesters alleged that the process was highly undemocratic. In particular, there were fears that it would result in average Internet users occasionally downloading pirated films being treated like commercial counterfeiters, who profit from selling large quantities of pirated products on the black market. Perhaps more significantly, though Europe has today rejected ACTA, it could still end up being enforced elsewhere. So far the United States, Australia, Canada, Japan, Morocco, New Zealand, Singapore, and South Korea have all signed up to the treaty. Six of these countries would need to ratify (formally approve) ACTA to bring it into effect. Earlier this year there were battles around U.S. anti-piracy bills SOPA and PIPA, both of which were put on hold after unprecedented online protests. Any future attempts to control the Internet will almost certainly face the same amount of opposition. On Monday, a coalition of more than 85 organizations released the Declaration of Internet Freedom—a significant global call to keep the Internet free, open and without censorship.